I’m not sure how much longer the mega sale is going to be running at Familius. 50-70% of some of their bestselling titles. For example, they’re selling both of my books for cheaper than I can buy them with my author wholesale discount ($6 each!). There are also a ton of other great books, fun, quirky, useful, interesting, well-designed books that would make great Christmas gifts. I have no affiliate link with Familius. Hey, wait, why don’t I have an affiliate link with Familius? Not that it would do me much good with this sale that’s going on because they’re practically giving the books away for free. Unplug and Play – 50 Original Group Games that Don’t Need Charging ($8) – With family coming in for the holiday this is a great resource for fun, original activities to do with all kinds of groups. Mix and Match Lunchbox ($12) – This is probably my favorite. It’s divided up into cards that you can mix and match, a protein, a whole grain, and a fruit/veggie course for thousands of creative lunch combinations. Shakespeare for Kids boxed set ($8) – My kids had a great time at the Shakespeare Festival last summer and this is an awesome way to help them learn the storylines of some of Shakespeare’s greatest plays. The Stevia Solution Cookbook ($5) – We are so sugar addicted. I love this moderate approach to replacing some of the sugar in your diet with a natural alternative. To be honest, I’m just digging in and haven’t tried the recipes yet, but I like what I’ve seen so far. I am Vegan sometimes. Sometimes I’m Paleo. Every once in a while I’m a Dorito-tarian. (Don’t tell Jamie Oliver!) I love food. I dream about food. I consume it in ample quantities and I spend a lot of time thinking about what I do eat, what I should eat, and what I will eat. One of my biggest goals is adding more vegetable into my life in a delicious and sustainable way. By sustainable, I’m not talking about composting and buying local. I’m talking about eating vegetables in a way that I’m willing to do over and over again till death do we part, which hopefully won’t be for a long time because, LOOK, I’m eating so many vegetables! So I’m always checking out new cookbooks and I love vegan and vegetarian cookbooks especially because they focus so heavily on veg. I’ll take an awesome vegan casserole recipe and substitute chicken for beans or cheese for fake cheese. Because I like me some tasty animal products. 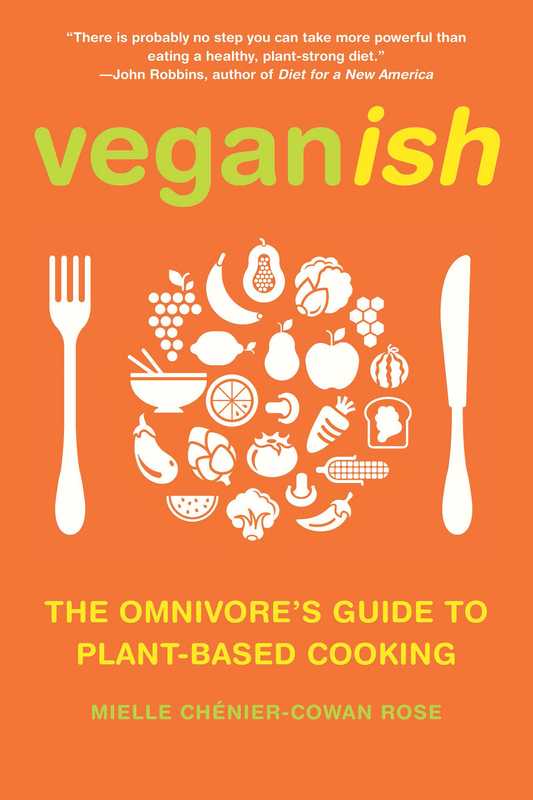 Mielle Chenier-Cowan Rose’s new-ish cookbook Veganish: The Omnivore’s Guide to Plant-Based Cooking speaks to the world of vegetable lovers who add in an occasional animal product for the health benefits. It’s pretty fabulous. The book has no pictures and a horrible index but the recipes and information are so good that I’ve gone back to it again and again. This is surprising if you know me and how heavily I rely on good indexing. I worked through several of her recipes, cooking from it almost exclusively for a week and we enjoyed nearly everything. I think during that week I tripled my family’s veggie intake and not just for the meals I was preparing from her recipes. Veganish gave so many great veggie prep instructions and just plain motivation to live and eat healthier, that I found myself snacking better, sleeping better and drinking more water between meals. In the introduction to the book, Mielle says she wants it to be more of a cookbook than a recipe book, to inhabit the nightstand as much as the kitchen. It did just that. I read it from cover to cover and got really fired up about eating better. I’m sure you will too. If your New Year’s resolutions for healthy living are starting to fade, this book is a good refresher. I’m giving away a copy. Just leave a comment below, listing your favorite veggie and I’ll choose a winner the evening of February 6th. You need to live in the continental US to win, unless you want to pay the shipping. The winner is comment #5 – Valeri! For those of you who don’t win the book, you get something too. By request, Mielle is sharing her Massaged Kale Salad with my readers. As a person who wants to love kale so I can feel superior to my spinach-eating friends, I was excited to find a salad that finally made this monster green palatable to me. I LOVE this salad. Maybe it’s because the kale is so happy and relaxed after its massage and happy food is tasty food. Whatever the reason, this one is a winner. I’ve made it for extended family dinners and neighborhood potlucks and it’s a crowd pleaser, among people willing to put kale in their mouths and chew. Enjoy! I love kale. I eat it every day and thank it for strengthening my bones. I usually chop it very fine, down to the tough bottom of the spine. If you’re new to kale, you may want to pull off the tender leaves and discard the spine until you can enjoy its hearty texture. Using your hands, firmly massage the salad for about 5 minutes until thekale is tenderized. Toss and serve at once or refrigerate up to 8 hours. 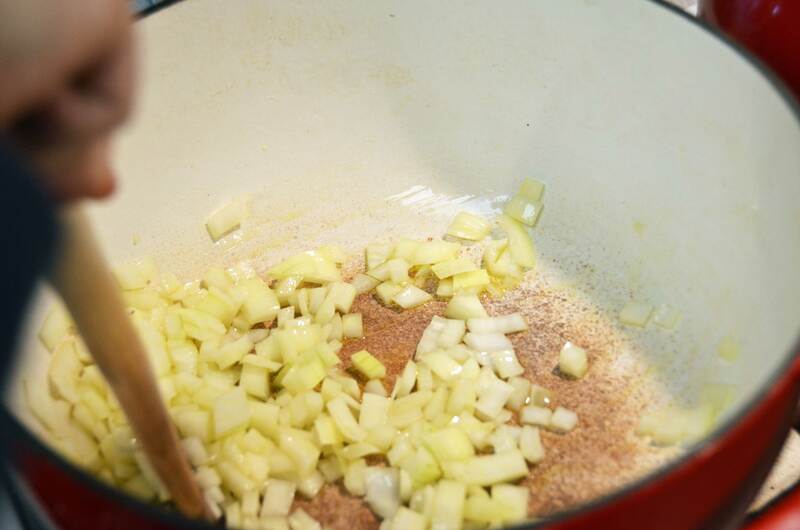 You start by sautéing half an onion in 2 teaspoons of olive oil until they’re soft and translucent. I believe that 83.4% of good recipes start this way. 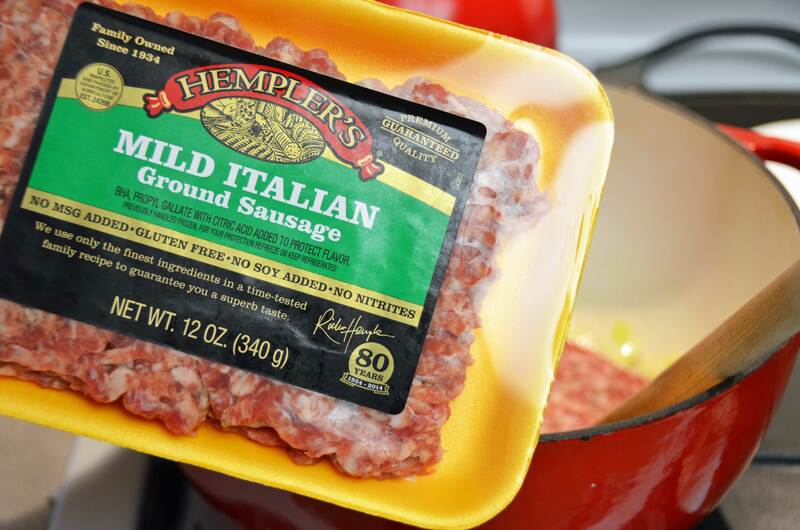 Then comes the magical italian sausage of joy. 12-16oz, depending on the size of the package you buy. More can only be better, right. Break it up as you cook it so the pieces are small and cooked through. 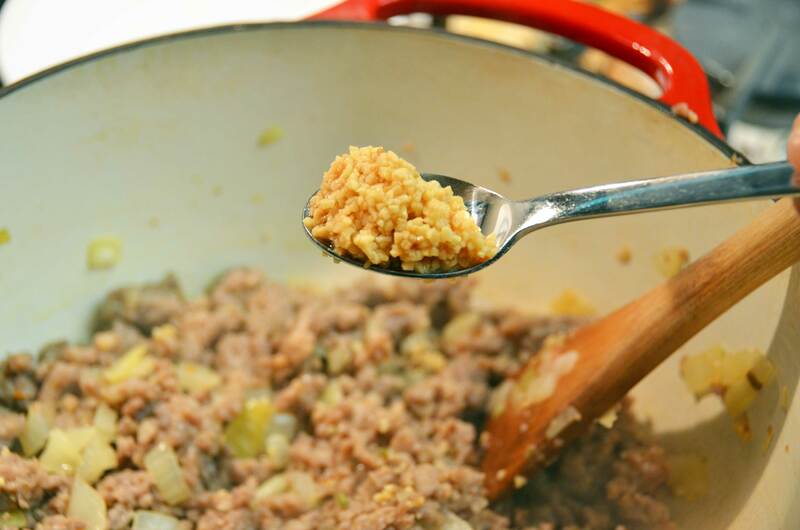 Add 4 cloves or minced garlic or just a big old spoon full. This was for a double batch. Next add 4 cups of chicken broth and 28 ounces of pureed tomatoes. I just threw diced tomatoes in the blender. 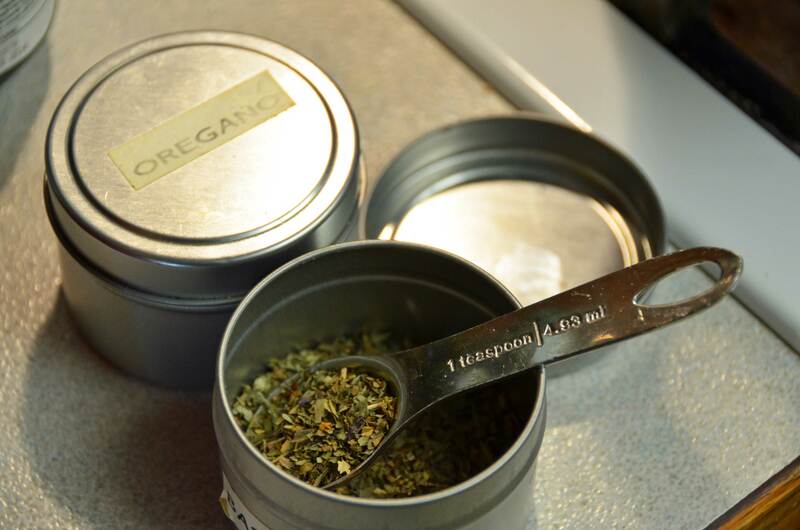 Stir in your spices, 1 tsp dried basil, 1/2 tsp dried oregano, a pinch of crushed red pepper, and salt and pepper to taste. My family hates spicy but I still threw in the pinch of red pepper flakes. It just gave it a tiny bit of warmth but I got no complaints and my people are GOOD at complaining about too much spice. Cover and let it simmer for as long as you feel like. Thirty minutes should be fine but two hours is better. Who has two hours to simmer? Then bring the soup to a boil and cook the pasta according to package directions. I love smaller pasta in this dish but feel free to use whatever kind you like. 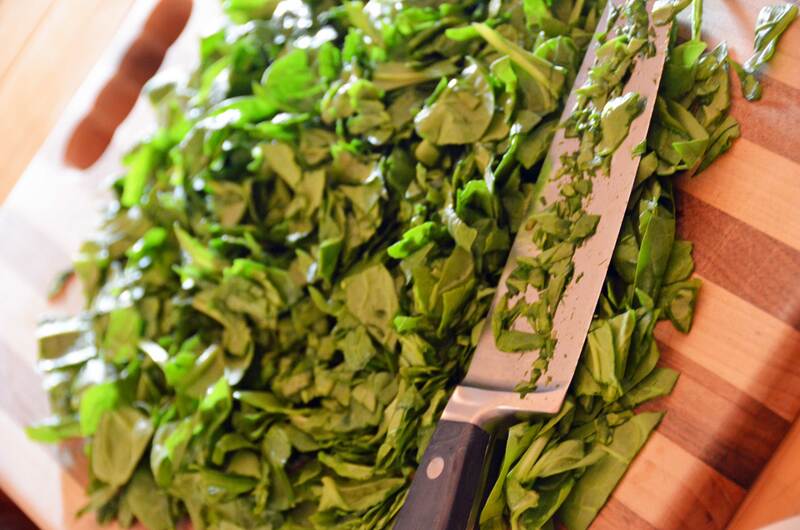 When the pasta is cooked, add 2 or more cups of chopped fresh baby spinach and 2 Tablespoons of chopped fresh parsley. Stir to wilt and warm it all and then serve hot with grated parmesan on top. For a freezer meal, do everything through the long simmer. Then cool and freeze in a Ziploc bag. Chop the spinach and parsley and freeze in a smaller Ziploc. Then assemble as directed. Heat the olive oil in a large over medium heat. Add the diced onion and sauté for a few minutes until translucent softened. Crumble the sausage into the pan and cook until no more pink remains. Add the garlic and stir for 60 seconds. Then add the chicken broth, pureed tomatoes, drained beans, and spices. Cover and simmer 30-90 minutes. Bring the soup back to a boil and add pasta, cooking according to package directions. 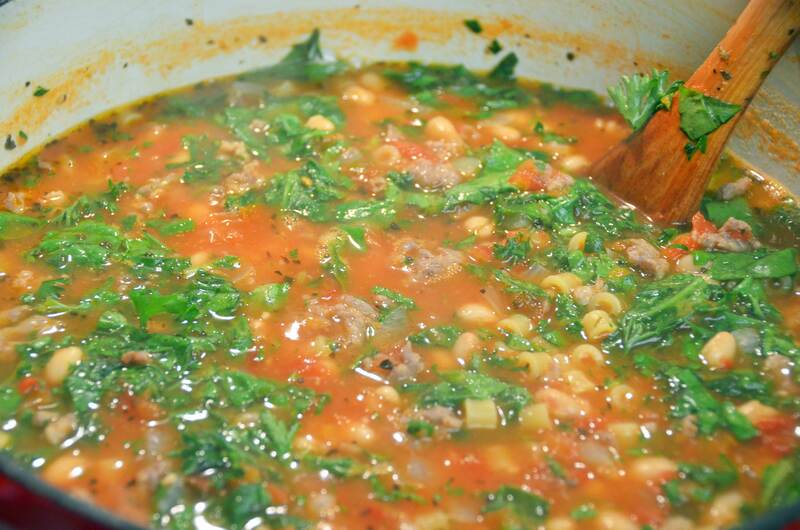 When pasta is al dente, add fresh parsley and spinach and stir just to wilt and heat through. 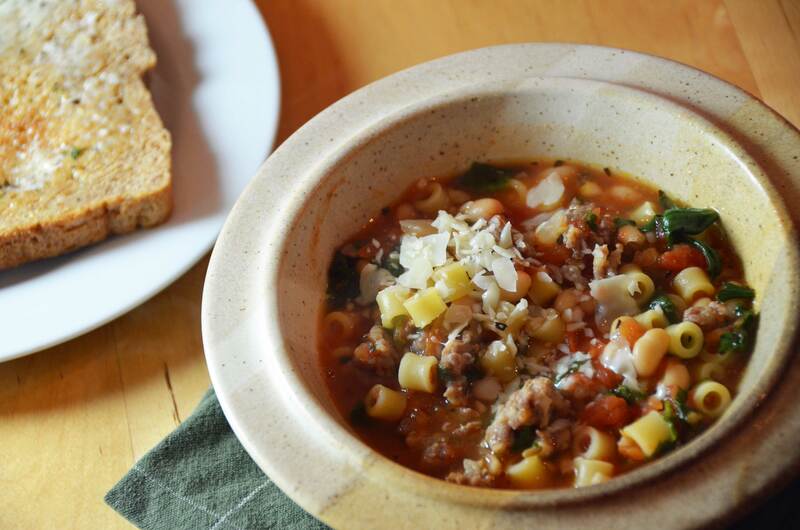 Serve with fresh grated parmesan. 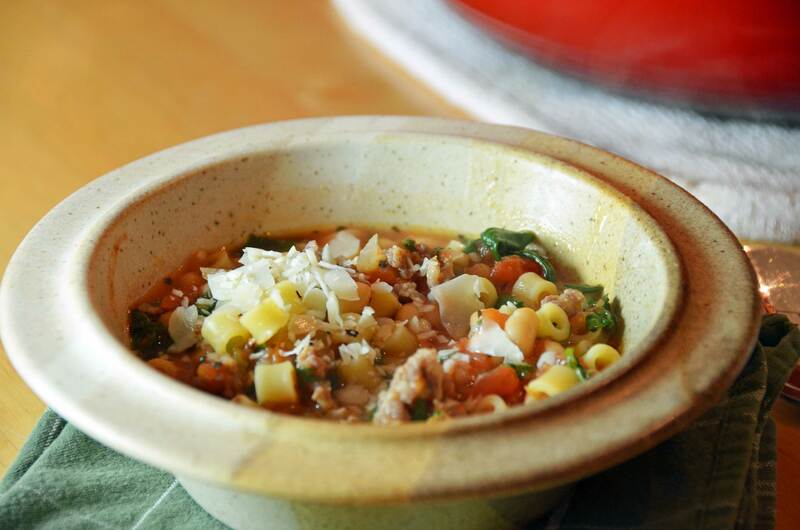 If you over-pasta, it will turn out more like a casserole than a soup. It’s still delicious, just not a soup.Feel free to add more sauce as needed. This is not an exact science. For a freezer meal, do everything through the long simmer. Then cool and freeze in a Ziploc bag. Chop the spinach and parsley and freeze in a smaller Ziploc. Then assemble as directed above. 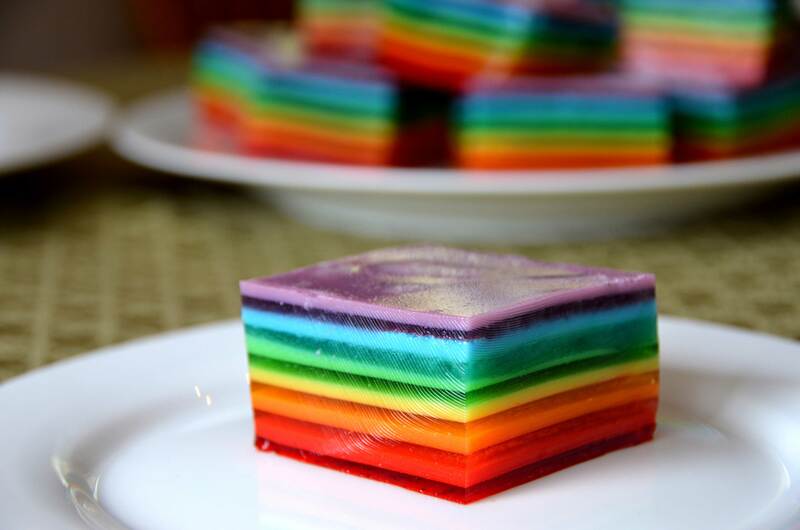 This Rainbow Jello was a special occasion staple in my house growing up. It takes time but it’s really simple and looks amazing. 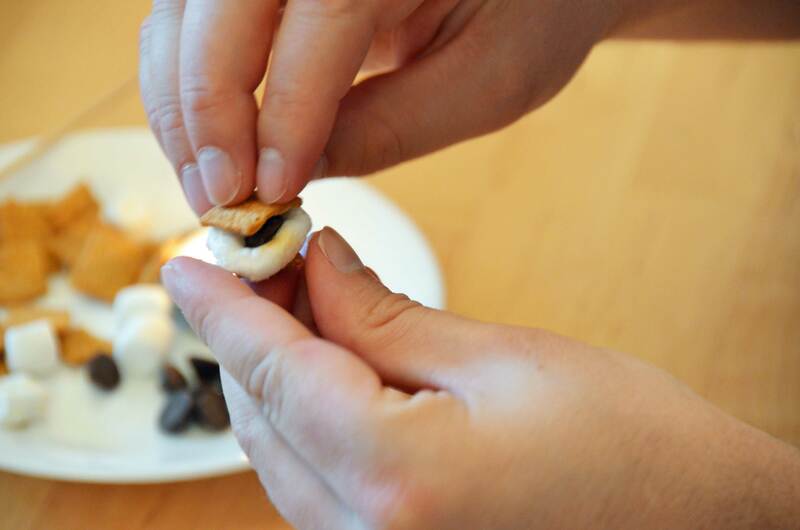 If you’re feeling adventurous, or wildly immature, you can try to peel off each layer with your fingers and eat them individually… or not. My eleven-year-old made it for Easter this year with no assistance and it was a huge hit. Enjoy! Dissolve 1 package of Jello in 1 cup of boiling water. Divide in half. Mix 2 Tbsp of cold water into first half. Pour that into a 9 x 13″ pan. Let set until firm (approximately 20 minutes*). Whip 2 Tbsp of sour cream into the second half. Pour the cloudy mixture over the clear jello. If you don’t want little pock-marks on the surface of your jello, be careful to remove bubbles before pouring the final layer. Let this layer set until firm (approximately 20 minutes). Repeat with each additional flavor. Cut into squares to serve. When halving this recipe, use a 9″ square pan and allow approximately 10 minutes for each layer to set. *The setting time is up to you. 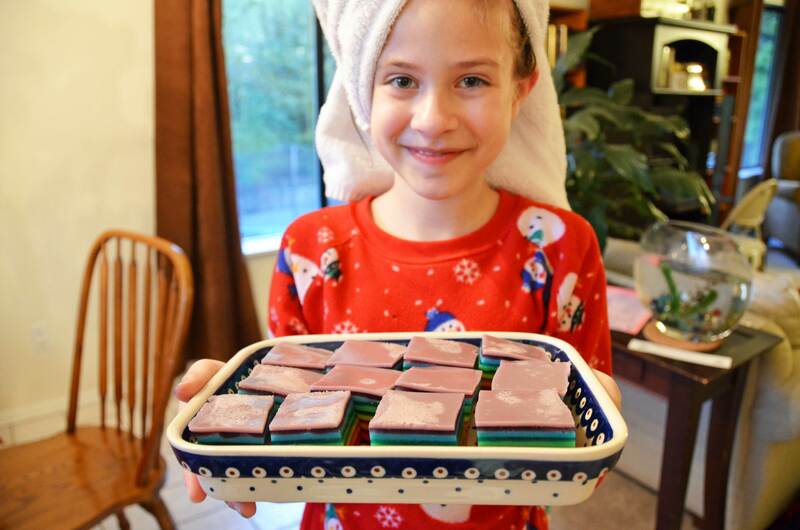 Laylee only let each layer of the large batch set for 10 minutes and had very few problems with the upper layers leaking through. I was at girls’ camp this summer, talking camp shop with some of my camp homies. Inevitably camp shop talk turns to s’mores because they’re much more fun than rodents, full body rashes, and hypothermia. 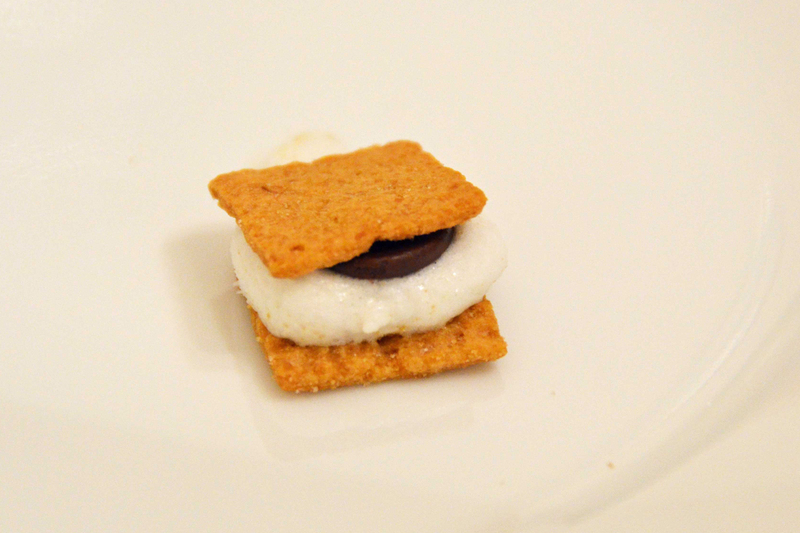 For the first time this summer I tried a little bit of camp heaven in the form of a peanut-butter cup s’more. 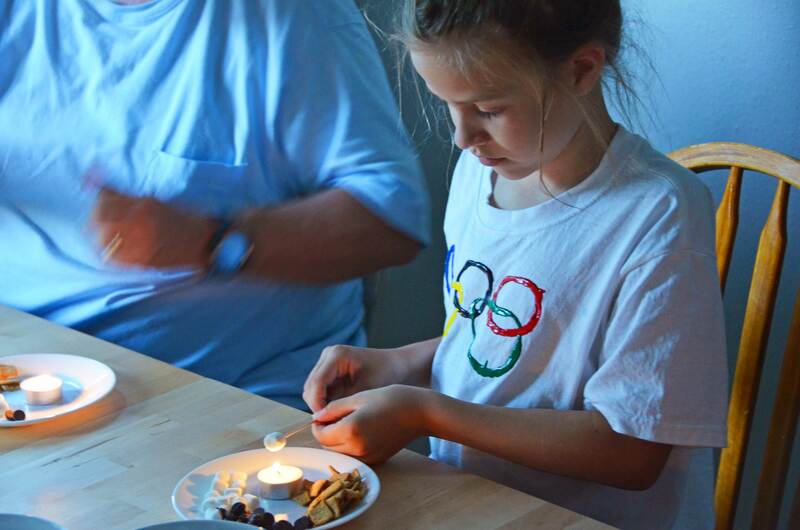 Some ladies like their s’mores on thin mint Girl Scout cookies and some eat the marshmallows straight up between two pieces of chocolate. And then they enlightened me. 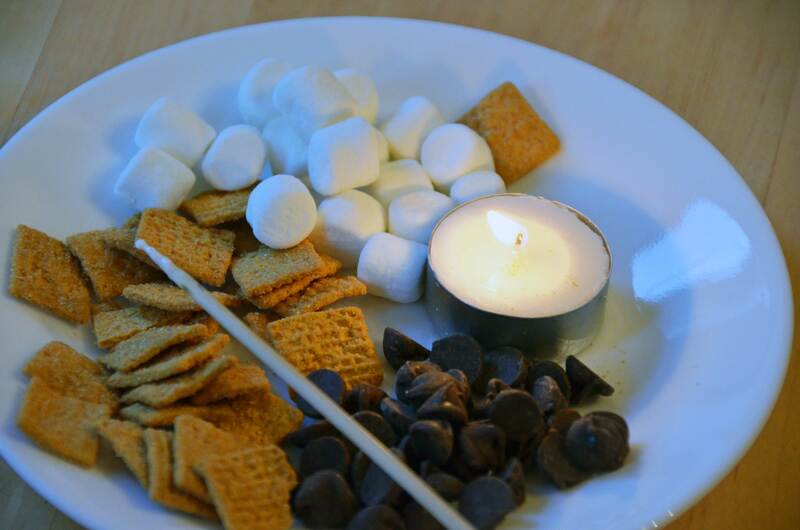 You take mini marshmallows, roast them over tea-light candles, and top them with a single chocolate chip, smooshed between two golden grahams. This is a great idea if you have visiting faeries or anyone under the age of 12 or anyone over the age who is not lame. I buy stuff at Target fairly frequently so I was pleased to see that they were expanding their grocery selection. When they sent me a $25 gift card to try out their new grocery department and blog about it, I figured it would make a good food post. This recipe is one of my favorites, a green drink smoothie I make to pump my kids and myself full of vegetables. They’ll eagerly drink three handfuls of spinach when it’s pureed into this mixture but ask them to eat four leaves by themselves and they’ll act like their life is over. 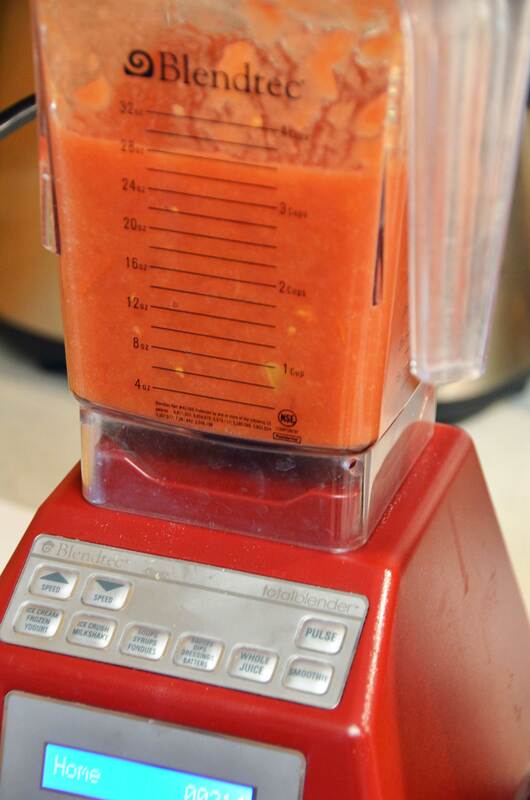 Throw your fruit in a blender. Stuff in as much spinach as you can. Pour your liquid over top. Blend until creamy and green. I like to use at least one frozen fruit, my favorite being one banana and a huge handful of strawberries. For fruit juice, I just use whatever I have available. For this recipe I used frozen strawberries, a banana, a bag of spinach and Dole pineapple/peach/mango juice, all purchased with my gift card from the fresh grocery department of Target. The dry goods selection is surprisingly good at Target, not to the level of a traditional grocery store, but decent and they have a good supply of basic produce if you’re not looking for anything fancy. They have meat, dairy and frozen foods now too. I found the prices to be really low on some things and high on others. Tillamook cheese, for example, was $8.99 for a baby loaf, way more than I’m willing to pay. Their bagged spinach, however, cost less than I find it on sale at the grocery store. Overall, I think it’s a convenient option if you’re going to Target anyway, but I wouldn’t make it my primary grocery source. I was going to say that this is not becoming a food blog but I can’t really commit to that because I love making and photographing food and lately I’ve been drawn more to blogs that offer me useful information so I may be posting more recipes or links to recipes I love. Today, I’m giving you my recipe for easy delicious whole wheat pancakes. Enjoy! Heat a griddle, cast-iron skillet or non-stick pan. I use a cool-touch griddle heated to 375F. Mix all ingredients in a bowl until they’re pretty well mixed and mostly smooth. I give the eggs a stir before adding the other ingredients but it’s not necessary. Grease the pan as needed. I use cooking spray but butter will be just fine if you like the taste of deliciousness. Use your ¼ measure from the vegetable oil to spoon batter onto your pans. Cook until golden brown on the bottom. Then flip and cook the other side. Top with fruit, peanut butter, yogurt, applesauce or syrup but probably not all at once. If your family likes to mow food like mine does, you can double this. A single batch makes about 12 pancakes and you can reheat the leftovers the next morning or as a snack. Sauté chicken with 1 tsp oil in large saucepan over medium heat, 5 mins or until lightly browned. Transfer to bowl and set aside. Add remaining oil to saucepan. Add onions, tomatillos, jalapeno peppers and garlic. Cook for 5 mins. Stir in chili powder, oregano, sugar, cumin. Season with salt. Add broth and bring to boil over high heat. Reduce heat to med-low, cover and simmer 30 mins. Stir in beans, corn, cilantro, lime juice and chicken. Season with black pepper. 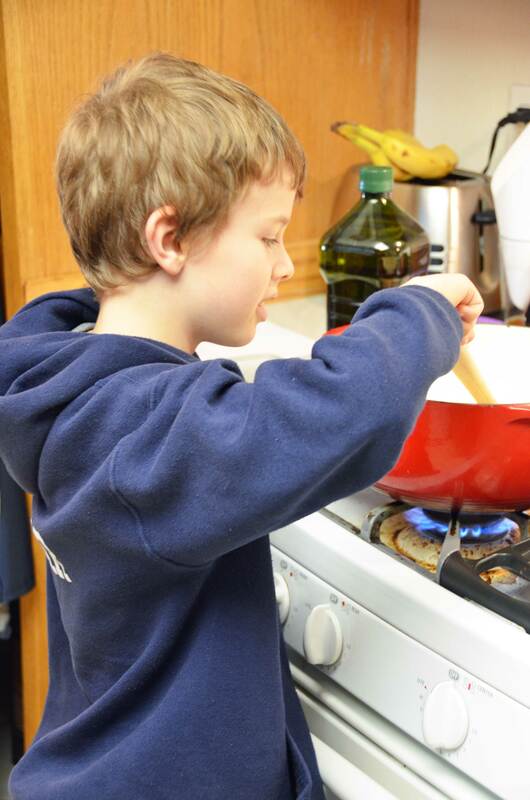 Place arrowroot or cornstarch in a cup. Add water and stir to dissolve. 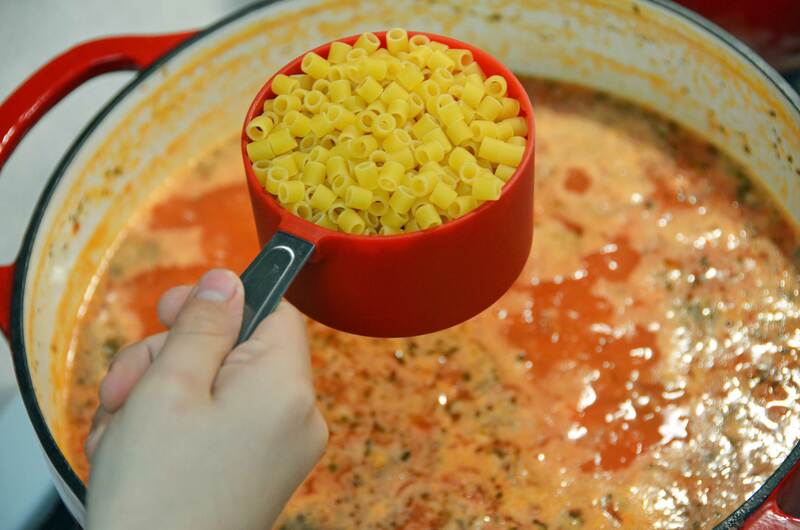 Add a spoonful of the soup to the cup. Mix, then add to the saucepan. Stir until slightly thickened. Simmer for 15 mins. Serve sprinkled with Monterey Jack or hot pepper cheese (if using).